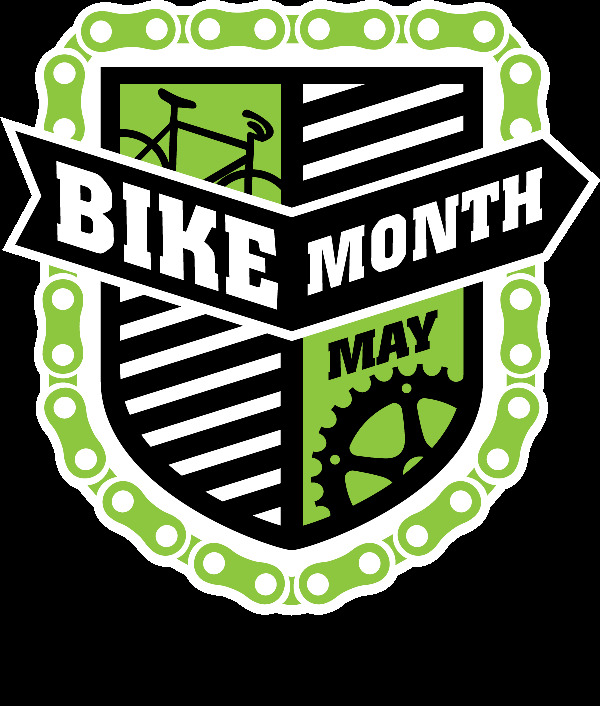 As part of National Bike Month, those interested in getting in on the movement this month can join in many fun events centering on Bike to Work Week May 13-18. More information on the Milwaukee events is here, below is a schedule of events. 8:00 AM: Bike to Work with Mayor Barrett, 51st and Washington Blvd. 5:00 – 8:00 PM: Bike to Work Week 2013 Kick Off, Stone Creek Cafe, 422 N 5th St. Free pizza from Transfer/VIA delivered by FLAVOR Cycle. Bicycle-themed fashion show featuring Howlpop, Vessel Workshop, local designer Nicole Labrie, and others! Coffee brewing demos from expert baristas, sample tastings, and 30% off coffee beans and brewing equipment. 7:00 PM: Pedal Pusher Ride, Coast In Bikes, 706 S 5th St. All women and trans-identified people are welcome to join us for the first ride of the spring season! A casual ride through the streets of Milwaukee. 4:00 – 6:00 PM: Valid Open House, 1011 W Center St.
4:00 – 8:00 PM: Antique and Vintage Bicycle Show , Milwaukee Public Museum, 800 W Wells St. The Wheelmen and South Shore Cyclery will display a rare collection of bicycles dating from the late 1800′s up to the balloon tire bikes of the 30′s through 60′s. Michael Horne will give a talk about the history of bicycling in Milwaukee. 5:00 – 8:00 PM: Sew to be Seen at Vulture Space, 651 N Plankinton Ave. Everyone is welcome to sew reflective material on their bags and clothes. Mo Lappin, the fashion designer behind Howlpop, will give a workshop on DIY fashion. A sewing machine/work tables, and innertubes/small bicycle parts will be available to be made into jewelry, streamers, clothing, etc. Bicycle Fiesta – Guided tour of Hank Aaron State Trail, used bike sale at Bike Fed office, 3618 W Pierce St. So, why should you bike to work whether just for this week or more often? Same reason to take public transportation plus wellness benefits. There are really three main reasons, each with their own laundry list of benefits. Save Money. Gas, parking, car maintenance, all can be a strain on your pocketbook. A bike requires no gas, far less maintenance, and zero parking costs. Save The Environment. In riding a bike over driving a car you are doing more than the obvious reduction of gas usage and emissions. The less cars used the less parking needed. Parking lots and structures use up so much space that could be used for green space or even more buildings. Save Yourself. Bicycling is obviously a physical activity - exercise - which means better health for you. Which brings us back to reason 1 - better health means less health care expenses. If you commute to a city center, an interesting point is you can actually save time. Since everyone is going slow during rush hour bumper to bumper traffic and you can sneak past them on your bike, studies have shown you can go up to 50% faster on a bike than in a car during rush hour. Milwaukee may not be as bike friendly as many cities, but we are getting there, after recently painting many miles of new bike lanes on streets across the City we now have a network of 65 miles of bike lanes and 75 miles of bike routes on which to ride, and they plan to make more. Milwaukee Department of Public Works has a plan to add new bike lanes as streets are repaved and as grant money allows. The on-street bikeway plan identifies 145 miles of high priority streets for bike lanes and over 250 miles of streets on which bike lanes fit in the City. If you aren't sure of the best route to take on bike, the City of Milwaukee has a Milwaukee by Bike section and provides free maps at all area bike shops, libraries, City Hall, and County Parks. 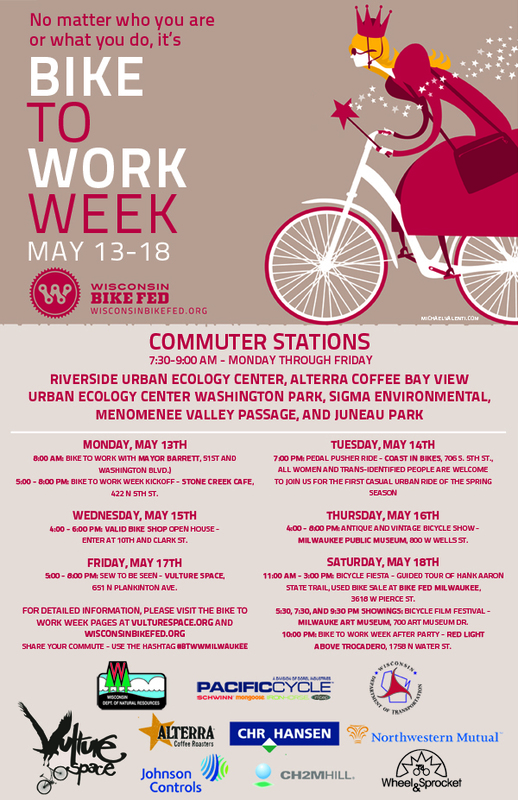 So far we have focused on Bike To Work Week since that is what the Fed focuses on, but May is a great time to bust out the bike in general and use it to get out and about in Milwaukee. If you just want to take a ride there are the dedicated trails, Oak Leaf and Hank Aaron, in Milwaukee. As you can see there are plenty of things to do on a bicycle that can get you out and about, get some exercise, be social, and possibly even be charitable. All while leaving your car at home and saving gas and with it money and the environment. So prepare for Bike to Work Week and get your bikes out this week and all tuned up and ready to go.